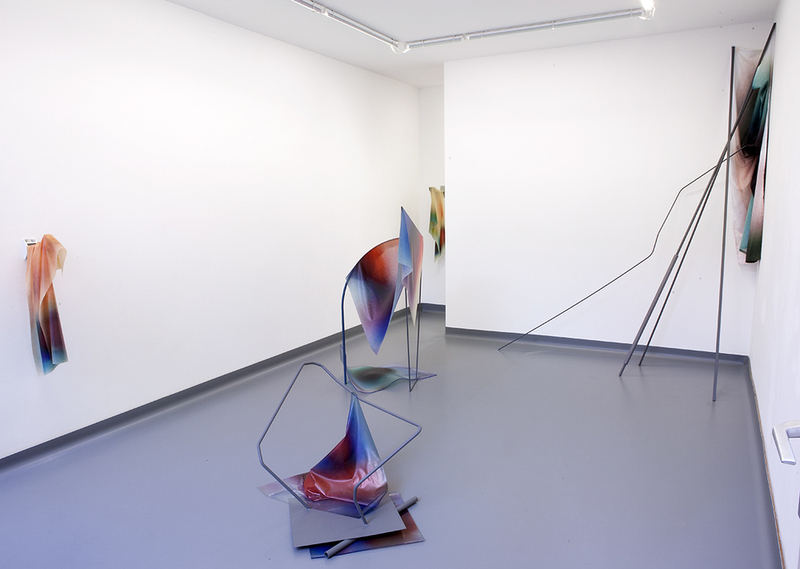 For the exhibition, Neutral (2016), at Galerie Jo van de Loo in Munich, Anouk Kruithof displayed the work Carry On (out of the project #Evidence, 2015) together with works from her latest series, Neutrals (2015) and Concealed Matter(s) (2016), the first consisting of metal structures combined with images printed on PVC, vinyl and latex, and the second made up of images printed on latex, draping over security camera bracket arms. Those prints are based on TSA Instagram images of neatly displayed groups of confiscated items, mainly weapons. The identity cards of the contraband owners were part of the display, but for privacy reasons they were blurred to a point where the gender or race of the person was no longer recognizable. The artist printed images of these identity cards on different flexible materials. The metal constructions, on which the prints hang, constitute the sculptural bodies of a new physical existence. This serves as a parallel to the original digital existence of images on Instagram accounts. The metal structures appear to have a de-humanized emotionality equal to the imagery added to them.